If you wish to visit the secret realms, defeat every Valkyrie, and view the secret ending, the gods will forgive you for using these God of War cheats. 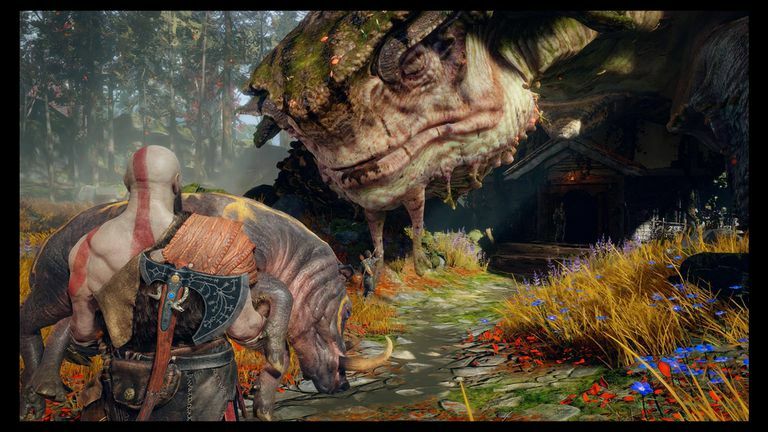 This article is about the 2018 game God of War for PS4. For help with the 2005 game of the same title, see God of War Cheat Codes for PS2. The Leviathan Axe can be upgraded to a maximum level of 6 by bringing frozen flames to Brok. You can get most of the frozen flames from bosses encountered during the main story. If you miss one, it will appear under the Lost Items section in the shop. The final frozen flame is obtained by trading in the Chilling Mist of Niflheim. It's locked inside a chest in the central chamber of the Niflheim realm. You'll need to collect 5,000 mist echoes to open the chest. Chaos flames can be used to upgrade Kratos' blades up to level 5. As with the frozen flames, all but one can be obtained during the main story. To fully upgrade the Blades of Chaos, defeat the Valkyrie in Muspelheim to earn the Raging Inferno of Muspelheim, then exchange it for the final chaos flame. After finishing the game, choose New Game + from the main menu screen to restart the story with all of your previously acquired moves, equipment, and currency. Additionally, you can craft new armor including the “Cod of War” suit from God of War II. After finishing the main story, return to Kratos’ home and go to bed. You’ll then see a special preview of the next God of War game. Enter the cave underneath the witch’s house and look for a chest covered in viscera. After meeting Mimir, descend the stairs and pass the mystic gateway to find a chest. Cliffs Of The Raven Land on the beach southeast of the temple. Look on the left side of the cliff for a small opening covered by wood. Smash through it with your ax, and give Atreus a boost so he can drop a chain for you to climb. Go into the caverns northwest of the temple and climb to the upper level. Once you have four ciphers, you'll have access to Muspelheim from the Realm Travel Room. Go up the steps to the green garden area, then drop down to the snowy path. Look along the left side for another area you can drop down to where you’ll find a realm tear and a chest. Lookout Tower Search the beach south of the temple near the Odin statue's foot. Ruins Of The Ancient After gaining access to Konunsgard, travel northwest of the temple to find a Soul-Eater and a chest on the beach. Council Of Valkyries Dock on the beach just right of the giant statues holding oars. Break the red crystals to clear a path and climb the cliff wall to find a chest. Niflheim will be selectable from the Realm Travel Room after you collect the ciphers. The Golden Talisman of Protection is a helpful accessory that can be obtained early in the story. After gaining access to the temple in the Lake of Nine, travel northeast to Stone Falls. You'll have to battle some revenants and solve a puzzle to reach the chest containing the Golden Talisman of Protection. To get the most powerful pommel for the Leviathan Axe, you must scale Muspelheim Tower in the southern region of the Lake Of Nine. It's only accessible via the Lookout Tower boat dock once the water level has dropped far enough for you to reach it. Pause briefly while looking at each location. You’ll hear a gong sound halfway through the process if you’re doing it right. Straight ahead at Tyr's Temple. The left brazier on the Muspelheim Tower deck. The right brazier on the Muspelheim Tower deck. Down at the floor of the Muspelheim Tower deck. This may take a few attempts, but once executed correctly, a realm tear will appear containing the Grip of Ages. Speak with Sindri in Niflheim to learn about Ivalidi’s Workshop. Earn 500 mist echoes, then talk to Sindri again to get the workshop key. There are nine pieces of rusted armor in the workshop that are required to craft the Mist Armor. The Shattered Gauntlet of Ages is an obvious reference to the popular Avengers movie franchise. After completing the "Fafnir's Storeroom" favor for Sindri, take on the "Family Business" favor. The mission will send you to Northri Stronghold where you’ll obtain the Exotic Shattered Gauntlet of Ages. To upgrade the gauntlet, you’ll need five dragon tears. One is obtained during the main story, and three of them are earned by freeing dragons around Midgard. The fifth must be pilfered from the dead body of Baldur's dragon near the top of the Forgotten Caverns. Once powered up, the gauntlet can be augmented with special gems that grant Kratos new abilities. To get the fully upgraded Valkyrie Armor, you'll have to beat the Valkyries. The Valkyries are the strongest enemies in the game. Nonetheless, you can encounter some of them early in the story after completing the "The Magic Chisel" mission. Once you find one of them, the "Prove your Valour" side mission will begin, and all Valkyrie locations will be marked on your map. After beating the eight Valkyries, go to the Council of the Valkyries to unlock the battle with Sigrun. She is significantly stronger than the others, so go in prepared with your best equipment and runic attacks. If successful, you'll earn Sigrun’s Helmet along with some other loot. Bring the helmet to Brok for an upgrade.